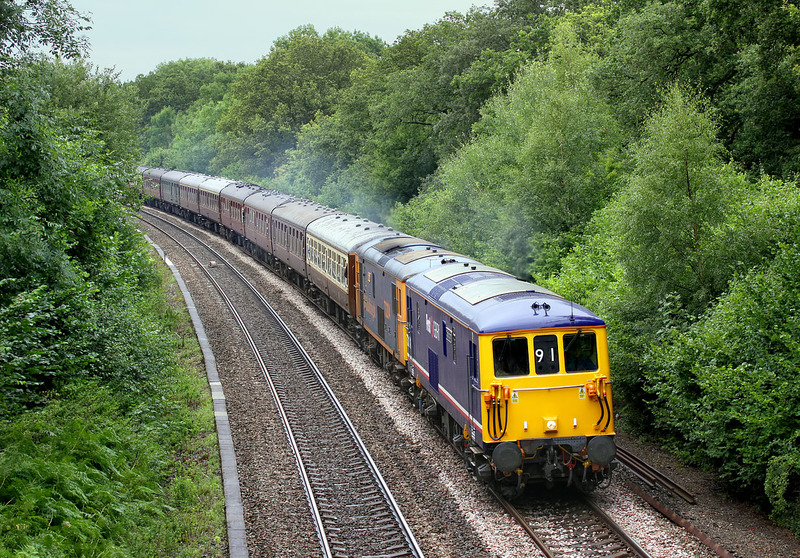 Still looking fresh in its recently applied First GBRF livery, 73141 Charlotte is paired with 73204 Janice and is pictured here passing Chineham on 1 August 2009 with the UK Railtours 1Z92 08:40 Waterloo to Weymouth 'Weymouth Seaside Special' railtour. Instead of running via what would be the obvious route straight down the former Southern mainline and then via Southampton, the tour instead traveled to Reading via Staines and then had to negotiate the non-electrified line between Reading and Basingstoke. Obviously it was therefore much more interesting to get a picture of the tour running 'off the juice'. Considering the pair only have 1200hp available when running on diesel, the EDs were running at a fair speed here.